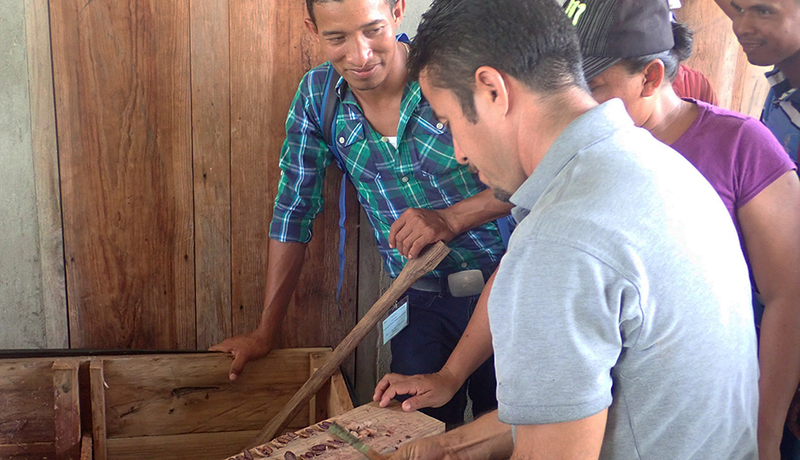 Fermentation is critical to a successful cacao crop, but in the Miskitia territory of Wampusirpi in eastern Honduras, the complicated trade-offs involved in getting cacao to markets make community participation just as important. 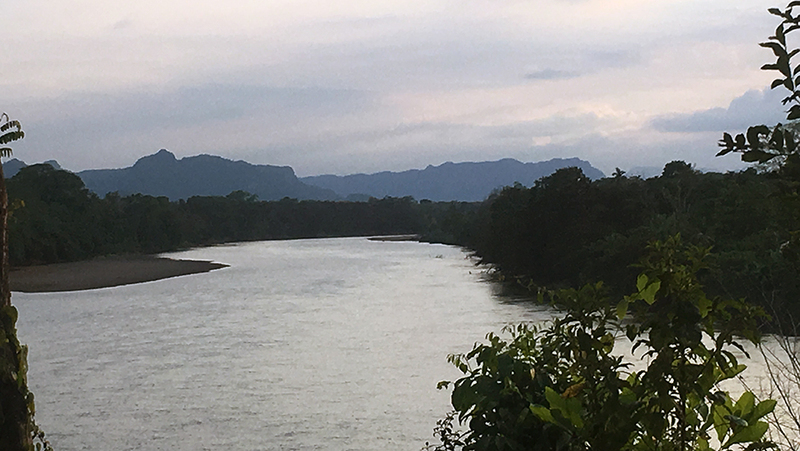 Located along the Patuca River, Wampusirpi is one of 12 recently titled territories of the Miskitu people. Archeological evidence suggests that indigenous peoples cultivated cacao in this area in pre-Columbian times, but modern commercialization of the crop took off in the 1990s, when cacao production expanded by over 350 hectares. 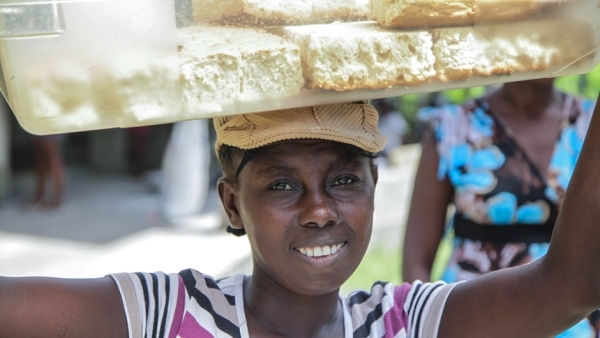 Hurricane Mitch in 1998 and a subsequent fungus epidemic destroyed 95 percent of Wampusirpi’s cacao plantations, but production has slowly recovered and today offers a pathway for people to improve their livelihoods. Conditions in the Moskitia region are ideal for cacao production, especially for high-end markets, but a deficient transportation system and insecurity over land tenure threaten to constrain growth of the industry. There are no roads connecting Wampusirpi to larger markets, which forces producers to use river transportation that is both expensive and risky. Road access would also benefit other agricultural markets and improve access to education and health services. However, the construction of a road remains controversial because it could prompt more migration into the region. Despite the Miskitu having recently obtained title to their lands, the invasion of indigenous lands is still a major problem, and community leaders believe land grabbing would get worse if a road were built. Thus, the Miskitu communities face the paradox that improving competitiveness by building a road could increase dispossession of their lands. One way to help resolve this paradox is to strengthen local governance structures and increase community participation in them. The benefits for the cacao value chain would then be more horizontal, and at the same time the process would improve the transparency and accountability of public investments. Wampusirpi producers face major hurdles to get cacao and other crops to market. The Association of Cacao Producers of Pimienta (APROCAPIM), the only community enterprise in the area marketing cacao, nearly collapsed when one of its shipments was downgraded from premium quality to an inferior grade in 2017 after cacao beans over-fermented, in part due to the long distance to the point of sale. Without roads connecting the Wampusirpi region to markets, producers have to make the treacherous journey upriver, paying high transportation costs and risking further damage to the crop if it gets wet. Elsewhere in Honduras, producers are only within a few hours of market centers by road. They can unload their products more regularly and in smaller batches, avoiding fermentation problems such as those that APROCAPIM has experienced. Efforts are under way to help producers tackle these issues. For example, at a I attended in Wampusirpi in April 2018, experts on cacao production offered instruction on cultivation, processing, and marketing to help address production problems in farms and collection centers. More than two dozen participants attended. However, it is clear that there are overarching questions that involve the role of infrastructure development in communities. 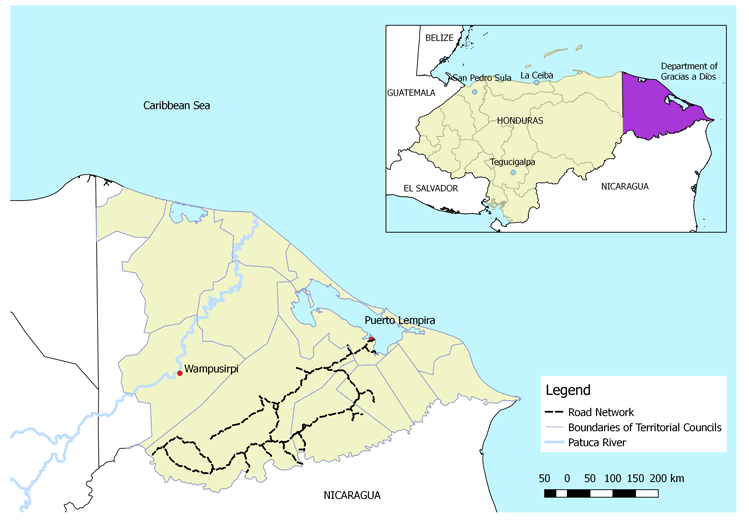 Currently, local government authorities are lobbying for construction of a road to link Wampusirpi to Puerto Lempira, the regional capital, which could cut transportation costs by a third. Agricultural producers could then take advantage of Puerto Lempira’s maritime link to the seaport of La Ceiba to ship products, further reducing transportation time and cost. Although building a road would certainly have its advantages, not everyone is convinced that Wampusirpi is ready for the consequences that could emerge from this type of development. Road construction has been associated with the destruction of tropical forests and dispossession of indigenous populations worldwide. Since the 1980s, waves of colonists have entered Moskitia, damaging the environment and prompting indigenous leadership to seek legal protection of their lands. The rise of drug trafficking activity in the 2000s increased speculative investments in land, leading to a land grab. This situation would arguably be much worse if there were shorter transportation routes connecting the region with the rest of Honduras. In the face of these mounting threats to Miskitu lands, and after a decades-long fight, the organization Unity of the Miskitu People (MASTA) succeeded in getting 10,000 square kilometers of its homeland officially titled to the Miskitu people in 2016. Despite this official government recognition, however, MASTA and the territorial councils it represents continue to struggle to reclaim illegally settled land and prevent new land grabs. While a road could provide significant economic benefits for more remote communities, MASTA maintains that without resolving the land question, a road would exacerbate the threat of illegal land settlements. At the local level, sentiments are more mixed, with people debating the benefits and risks of building a road. Rather than turning the road issue into a development versus anti-development debate, the situation is providing an opportunity to foster more inclusive governance. In Wampusirpi, the titling process involved the creation of a territorial council and 15 communal councils that are beginning to facilitate opportunities to discuss and decide on important decisions such as the construction of the road. A major accomplishment came in 2016 when the councils discussed and approved a Plan de Vida (“Plan for Life”) outlining development goals and initiatives for their territory. 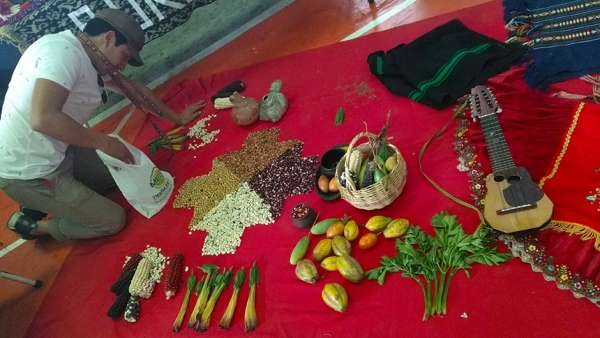 In a more recent development, cacao producers have been working through the communal councils to create their own association to represent their interests vis-à-vis the territorial council, local government, and the private sector. Just as fermentation is crucial to flavorful cacao, community participation is crucial for the workings of a successful value chain. Communal councils provide spaces to share knowledge and coordinate actions among producers, negotiate deals with the private sector, and consult with indigenous authorities and local governments on important decisions. Most importantly, participatory governance could be the key ingredient for more secure land tenure. As the Miskitu have learned from painful experience, legal title can only go so far in terms of protecting against encroachments. For example, area residents need to have economic alternatives and a sense of shared goals in order to withstand the every-day pressures to sell land. So while the state is still responsible for providing legal protection for indigenous lands, the communities’ participation is indispensable to maintain land tenure security. However important cacao production is to livelihoods in the Miskitu territories, the mechanisms being put in place in Wampusirpi to address the issues faced by that industry could also come to be an example for improving participatory governance in value chain management. Fernando Galeana Rodriguez is a doctoral candidate in Development Sociology at Cornell University and IAF Fellow whose research is supported by the Inter-American Foundation.